Think of this professionally made video as a week-long workshop plus a refresher course you can watch any time you like. Watching a skilled artist create a moku hanga print is needed to understand the intricacies of this demanding form of woodcut printmaking. Ms. Kuroiwa is a master of her craft, and her love and quiet enthusiasm for printmaking is contagious. As a teaching aid, an introductory lesson, or a refresher course for more experienced printers, this step-by-step video is truly invaluable. 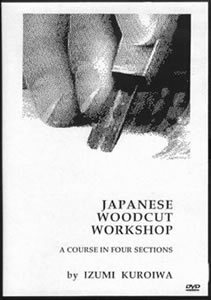 The DVD is in English and is bookmarked so it is easy to find the section you want to watch and comes with a glossary of Japanese printmaking terms.